Durable 12 gauge steel shelves with under bracing, 3/16" thick angle corners, and 12 gauge caster mounts for long lasting use. Raised offset handle (12" above top shelf). 1-1/2" shelf lips down (flush) on top shelf and lips up on bottom shelf (see options). Clearance between shelves — 17". Top shelf height — 28" (see options). 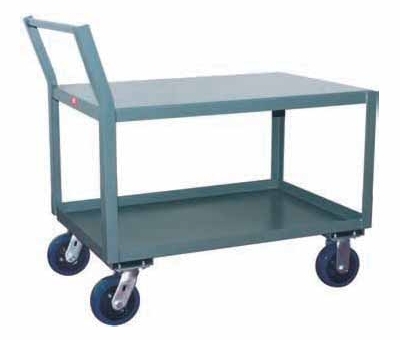 8" casters (page 123) and other shelf heights available. (IN) 6" CASTERS CAT. NO. 'S WGT.